Font choice is one of the most critical design elements that reflects the craftsmanship of the designer involved in any design project. Choosing a font is not just about font size, color or legibility. Instead, the font sets the tone for the entire business card. The right font clearly shares your message while fitting in seamlessly with the rest of the card design. Fonts should always be in sync with the design and target audience, so it’s important to have an arsenal of amazing fonts at your disposal for various projects. Here is a collection of 15 simple, yet professional, fonts suitable for business cards. Helvetica is a classic for a reason, and it remains a top choice when it comes to business cards. Helvetica is simple without being boring. The Grotesque sans serif typeface was originally designed in Switzerland in 1957, and it quickly replaced Futura as the most popular sans serif in the world. KG Sorry Not Sorry is easily readable with a casual flair, so it’s a great choice for users who want their business cards to have a conversational feel. Riesling adds a European touch to any design, and it is sure to stand out on any business card without feeling overly showy. Gibson continues to be a popular font among designers for a good reason. It offers an easy to read Sans Serif typeface created by famed Canadian type designer Rod McDonald. Many times, less is more, and the hallmark of Ciutadella is its simplicity. The font’s clean appearance fits in perfectly with a variety of design styles. Creator Eduardo Manso designed this geometric sans serif font to be simple without being boring. If you’re searching for an open font with a modern look for your business card, you can’t go wrong with Centrale Sans. This warm, friendly font is professional without feeling stuffy. Like its name suggests, this font offers an infinite amount of possibilities. Infinity is easily legible with a uniquely modern touch. When you utilize this font on your business card, you’ll appreciate its simple lines and curves. This rounded, bouncy font has a whimsical flair. Thanks to its happy style, it’s an excellent choice for business cards for those in child-related businesses, such as children’s book authors, teachers or other specialists. Make a statement with this geometric, unconventional font. Your name is sure to stand out on your business card when you add a modern touch with Campton. The font incorporates touches from Johnston Sans and Gills Sans with a contemporary flair. Old world charm and modern, clean lines meet in the Jaapokki font family. The font is clean and well-balanced, making it an excellent choice for business cards and other print projects. Best of all, Jaapokki, two alternatives, and a large set of glyphs are all available at no charge to users across the globe. When you are creating a business card, you want to make sure that your message and contact information is clearly conveyed. Nexa offers excellent legibility thanks to its clean lines and understated elegance. The Nexa font family includes 16 different styles and weights, so you can add variety to your business card while enjoying continuity between Nexa styles. Bring a touch of classic style to your next business card design by incorporating Trajan. This font was inspired by classic Roman letterforms. Trajan’s understated elegance helps set your business card apart from the crowd while remaining professional. Future was first presented by the Bauer Type Foundry in 1928, and this classic font has withstood the test of time. Designers appreciate its generous line spacing and wide range of weights and styles, and viewers immediately notice Futura’s strength and clarity. CODE incorporates many details of traditional Sans Serif fonts and adds a modern twist. Designers describe this all-caps font as clean and elegant, and readers appreciate that it is straight to the point. If you want the information on your business card to stand out, Nevis is an excellent choice. This strong typeface features strong angles, and it is especially eye-catching when it is used in all caps. Use it to emphasize your name on your business card when you need to portray a strong, but friendly, persona. The next time you’re searching for inspiration for a business card font, looking through these choices is a great place to start. Consider the message you want to portray, and check to see if any of these fonts is the right fit for your needs. In addition to these 15 options, there are plenty of other amazing fonts available for today’s designers. How do you narrow down font options? What is your go-to font for business cards? We would love to hear your ideas below! There are hundreds of templates to choose from, but they are pretty basic and on the cheesy side, so not recommended if you want people to take you seriously. GotPrint actively promotes their GotGreen printing products and is proud to use soy-based inks and printing processes that are as environmentally friendly as possible. 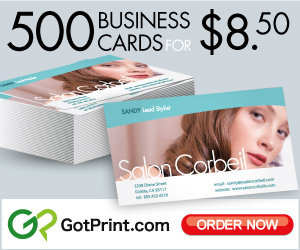 If you want business cards fast and cheap, you can t come close to beating the price with Got Print. This article was very vivid and touching. I found the composition very useful. Continue with the good writing! I believe Sans and Sans-Seriff are the two fonts preferred by many. Thanks for the heads up, though. These are cool fonts that I can use for my own card.